Its so true that people I know have stopped going to Greenwich so frequently compared to a few years ago. The parking is one issue, but even more so is the multiplication of boring chain and poor independent food places and the lack of decent shops compared to say East Dulwich, Bromley or Clapham. Greenwich now seems to attract mainly tourists with Londoners visiting just a few of times a year for a wander rather than frequently to shop. It doesn’t have any major stores or funky bars at night and there is only so much market shopping you can do. Shame that new town centre developments seem to be exclusively residential or education led as opposed to an interesting retail centre which would increase the towns appeal. Maybe the new Waitrose development will bring some funky little night time spots and some decent shops, like a couple of clothes shops, into the area. All I am asking for is somewhere to buy a pair of jeans! @FFBB The TfL study found that after “less traffic”, the next most important area for improvement to Greenwich highlighted by visitors was “better range of shops” so yes that probably is a big factor. Nope – the residents would complain. I don’t have much sympathy over high parking costs, after all, bus fares have rocketed in recent years – but the council’s deluding itself if it thinks Greenwich should cost more to park in if you want to pick up a couple of bits because it’s a world heritage site. For most non-tourists, Greenwich is no more a “key destination” than Lewisham, Catford, or Deptford, no matter how much the council wraps itself in its “Royal Greenwich” branding. Not quite sure what the council’s done to improve public transport in the 13 years since the DLR opened, either. Rob has hit the nail on the head. Greenwich council has little interest in anywhere outside Woolwich Town centre, to the detriment of Greenwich town centre and Eltham town centre. It is trying to pull Woolwich by the bootstraps out if its mediocre malaise to become the focus of Greenwich. Just another example of the social engineering this council exhibits at its core. Try as they might to push people toward pubic transport, there will always be a section of the community who, as is there right, wish to travel by car. They are no less important generally, and it could be argued, more important to local traders. Greenwich council have lost sight of the ball. Strong and healthy businesses are at the heart of any community. Kill them and you kill a community spirit. Funny thing, the council and its “town centres”. I remember in the 80s/early 90s, the council was completely Woolwich/Plumstead-centric; then things broadened out a bit under Len Duvall; and then under Roberts it became all Greenwich/Woolwich/Eltham, with everywhere else completely neglected (have a peek at poor old Abbey Wood, if you’re ever out that that). Now their sights do seem to be narrowing as they try to jump-start Woolwich again with some dangerous Tesco therapy. The main trouble is that few of the senior hands running the council actually live in or near Greenwich – Maureen O’Mara’s the only one that I can think of – so I suspect they really do fall for this “tourist destination” stuff rather than thinking of it as a place to live, work, eat and drink (unless you’re cleaning a hotel room on minimum wage). There were a couple of surreal exchanges about the borough’s town centres at the last council meeting on Wednesday, involving Denise “foot tunnels” Hyland, whose brief is almost the size of John Prescott’s old one under Blair (and she’s about as good as it as he was). If this area had a proper local newspaper, instead of relying on this site and people doing it in their spare time, these would all be great stories. One was from a Tory – think it was Blackheath Westcombe’s Alex Wilson – on what the council was doing to mitigate the effects on Woolwich of the new Tesco. Hyland then went into a rant about the coalition, ending on how she wanted to see a Labour government returned. She then went into some misty-eyed recollection of seeing the (still unfilled) Woolwich Equitable building lit up with the new council crest, and spoke of how she thought all three of the council’s town centres were “special”, like she was talking about kids that’d just been caught shoplifting from the greengrocers. Sadly, these are the people running the show. And without proper scrutiny, it’ll carry on this way. The parking meters are slightly cheaper and you can pay incrementally, 20p per 5 minutes. I do not share the pessimistic views of those who seek to rubbish the Council in its determination to improve all of the Town Centres. of course some might think,well he would say that as he is involved in the process. However we do not always get things right. If the Town Centres are to increase footfall development opportunities are critical. Tesco is just one element of that. 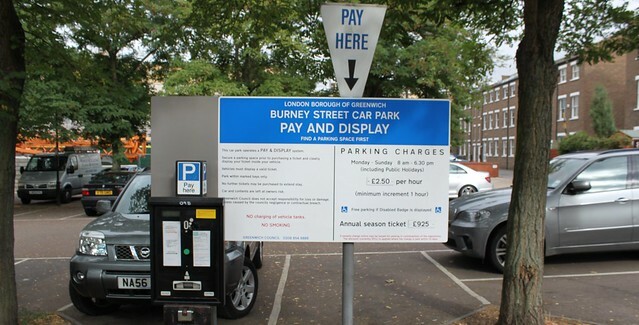 Three hour free car parking will help but the Council should and must have a review of its parking charges. Stratford City was charging a maximum five pounds a day over the Christmas period,with the first two hous free. There needs to be a balanced approach to parking charges but should not be about pricing people out of the Borough but going somewhere else to shop. Eltham Town Centre with no charges is not improving footfall. I suspect the debate will rage in the coming months. The loss of jobs in the Arsenal in the sixties was a body blow for Woolwich and continues to suffer. Why is it wrong to maximise the growth of Woolwich. It is a cause that I fully support. Gradual improvement in the coming months and years will see significant progress. Look around to see the developments taking place. I suspect there will be the usual sniping from the sidelines. If individuals or political partis think we are getting it wrong. Stand up and have your say. Happy to engage in the debate.